A museum’s history is often as complex and varied as the works of art in it. Each of the three museums in this series have their own websites that can give you their stories of creation and evolution, so there is no reason for me to repeat that process here. This series is from the point of view of a traveler entering the gates of a far away city. I arrive thirsty and hungry and ready for any and all temptations …I stand eager to be stimulated and seduced…and the gates open. 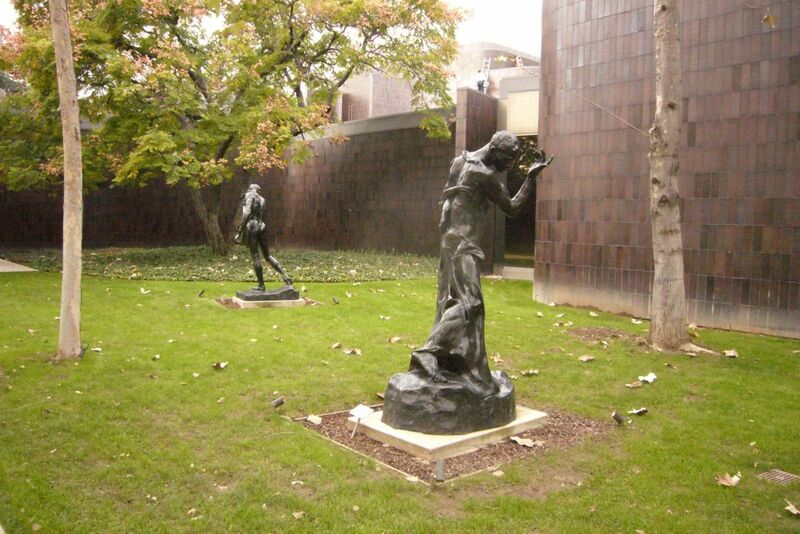 Most supermarkets have bigger parking lots than the Norton Simon Museum in Pasadena. It is the smallest building on the smallest campus of the three major museums in this series. Intensely compact, the Simon’s focus is a very high quality of art that never becomes the overgrown cultural smorgasbord that often leads to institutional mediocrity. From the moment you drive into the free, single-level open sky parking area, everything about the Simon fits and flows. As you leave your car you are already in a garden-like setting and the paths lead to a welcoming arrangement of larger than life Rodin sculptures. Without yet having breached the front door, you have been engaged by the narrative of Western Civilization. You cannot look at these works without also seeing everything that came before and after, and without feeling the weight of your own sack of skin and muscle and bone. I have intentionally avoided pictures of the inside of the Museum because photographs cannot do justice to the art nor the experience of making your own entrance. Step through the doors and you are inside the core of the Simon. It reminds me of a flower with the petals made up of the four wings and a large theatre. One level below is the South and Southeast Asian galleries. The core, the center of this flower is for special exhibitions. Today I have come to visit the four wings that hold the story of my own history. These centuries of human emotion are the mirror I will be gazing into. The first wing is filled with the 14th to 16th Centuries. Early, High, Mannerist, Northern, Southern…a Renaissance is a Renaissance is a Renaissance…and it is not my favorite art but neither I nor the Simon can ignore it. The Museum’s collection does more than just give a prerequisite Renaissance experience. With a selectivity and quality it demonstrates the genius of the Renaissance artists without beating you over the head with the religious messages. Perhaps it is the size of the museum that keeps it all more intimate and accessible. If you came to overdose on the Jesus and Mary Show this is not the museum for that…for the Simon’s examples of secular humanism hold equal stage. Giovanni Bellini’s Portrait of Joerg Fugger is wonderfully alive…I wanted to step in front of Fugger and force him to look at me, to engage him with questions about his life. 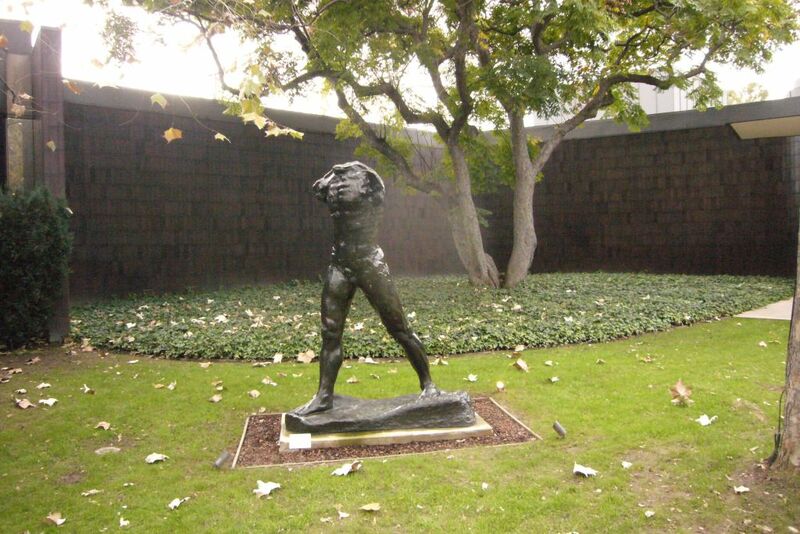 One of the important elements in the entire Norton Simon Museum experience is the outstanding presentation of all the art. The height at which the art is hung and sculpture placed, the skill of of the lighting, and the flow of the groupings, for me it is the best of any museum in the city. Never once did I find myself bobbing and weaving like a drunken prize fighter at war with glare and reflection on the art work. The second wing throws us into the 17th and 18th Centuries…carried there by Guido Reni’s portrait of St. Cecilia. Reni overwhelms his religious subject with stunning technique that makes this artist the real center of the painting. Art for art is now an unstoppable wave and the Simon immerses the viewer in Baroque paintings from Italy and Spain and the North. Everywhere you turn life explodes. Jan (Johannes) Fyt’s Still Life with Red Curtain and Zurbaran’s Still Life with Lemon, Oranges and a Rose filled me with child-like awe at their skill. Thomas de Kayser’s Portrait of a Father and His Son; Marie Genevieve Bouliar’s Self Portrait; and Theresa, Countess Kinsky by Marie-Louise-Elisabeth Vigree-Lebrun all remind me that I am walking through a world of hearts that once beat as furiously as my own. The last two wings contain the 19th and 20th Centuries and I cannot separate them because they are wife and mistress to our modern life. And here the Simon shines with outstanding art. Edgar Degas is everywhere…his paintings and sculptures swirl around you…taunt you. At first I was overwhelmed and then quickly I was glad. It felt as if this were his studio and his home. I’ve often thought that the best Renoirs are always someplace else. Until today. But don’t look for the large grand canvases that have been reproduced on everything from coffee mugs to refrigerator magnets. At the Simon you will find small intimate Renoirs that will make you forget the “famous dead artist” and replace him with the living and curious and passionate and vulnerable Renoir. My feet are no longer on the ground at this point…I am picked up on a Barbizon cloud and it carries me forward through the dreams of Corot and Monet and Seurat and Gauguin and Caillebotte and Lautrec…and at last I am at the feet of my personal Buddha, Vincent van Gogh. Even the Metropolitan in New York did not satisfy my eyes for his work. But at the Norton Simon there is a wonderful sampling and it is just large enough so that you can say “I met van Gogh today, and we talked awhile and then went our separate ways.” And for those who can only dream in modern media, take the time and you will come to discover that Vincent van Gogh is 3D…without the glasses. I think Gertrude Stein would like the Museum’s view of the 20th Century…even the pictures she didn’t like. What would Picasso say to Sam Francis? What would Matisse think of Warhol? Would Modigliani and Braque agree? Perhaps it is because of the size of the Norton Simon Museum that this is a perfect place for making the walk from the Renaissance up to and through the last one hundred years. By the end of the journey you haven’t just viewed a history of the people of Western Civilization, you have also gazed into the mirror that this art offers and you have seen a reflection of yourself. And when our prejudices become an acid inside us, that is when we can turn and look back at the footsteps we have been walking in…and we can unflinchingly question ourselves and our lives, as every artist present in the Norton Simon Museum has also done. This is a museum that has confidence and competence in its bones. This is an art lover’s museum…and a museum’s museum.